Practical training for members via simulation exercises is an important component of the National EPP Training Program. These exercises support the other forms of training delivered and test specific aspects of member’s biosecurity emergency preparedness. Together with discussion exercise activities that are included in the face-to-face training, PHA also works with members to delivery larger scale functional exercises, such as those listed below. Exercise Fastidious, held in Brisbane on 14-15 November 2018, tested elements of a response to the detection of Xylella fastidiosa, Australia’s number one plant pest threat. Although the focus of the exercise was on the production nursery sector, the broader implications to all industries were considered. Initial exercise outcomes included an agreed position for eradication, identification of gaps in Australia’s preparedness to respond to Xylella and the development of research questions to fill some of the gaps. A full exercise report will be prepared by PHA in 2019. Exercise Bee Prepared simulated a response to a detection of varroa mite (Varroa destructor), considered the greatest challenge facing world beekeeping. Participants developed a response strategy to eradicate varroa mite from a peri-urban environment, for the days immediately following a fictional detection of the pest. 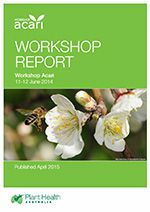 Between March and October 2018, PHA facilitated workshops across the country to test varroa response arrangements and availability of resources. The Australian Government and each state and territory government hosted an Exercise Bee Prepared activity. The exercise concluded with a national meeting to assess what was learned and agree on a national approach. 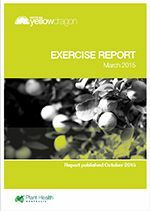 A consolidated report on the outcomes of Exercise Bee Prepared is expected to be released in 2019. 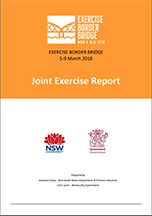 Exercise Border Bridge was held on 5-9 March 2018 to test how NSW and Queensland would respond to a biosecurity incident occurring across both jurisdictions. The focus of the exercise was the use of legislation, IT systems and existing arrangements to respond to the biosecurity incident. PHA helped to plan this large simulation exercise which was run by NSW Department of Primary Industries, Queensland Department of Agriculture and Fisheries, and the National Biosecurity Response Team Advisory Group. The report on the exercise is available here. Exercise Haryana was a simulation exercise designed to test the preparedness for, and our ability to respond to, the detection of Karnal bunt in Australia. Karnal bunt is a serious exotic fungal pest of wheat, durum and triticale that impacts on the quality and marketability of the grains. This exercise built on the significant preparedness work already undertaken by the grains industry and a number of governments, consisting of nine activities in 2015-16. Activities covered public information in a response, surveillance, tracing, movement controls and national decision making. More information about the public information activity and its outcomes can be found in the Exercise Haryana Activity 1 – Public information report. A complete analysis of all activities, the outcomes and the 26 identified recommendations can be found in the final report, Exercise Haryana – Exercise Report. Response operations under the constraints of an urban setting. Tracing of potential host material through nurseries. Engaging the community effectively to support the response efforts. The exercise was hosted by NSW Department of Primary Industries and included 35 participants with a range of experience in emergency responses from the citrus and nursery industries, government agencies and PHA. More information about the exercise and its outcomes is in the Exercise Yellow Dragon Report. 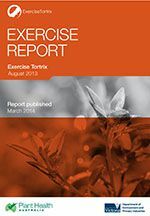 Exercise Tortrix simulated a detection of false codling moth, a serious exotic pest that could, in the case of a real incursion, potentially cause huge losses to plant production in Australia. To determine how to respond to an incursion, 70 representatives from industry and government came together during the week of 12 August 2013 to participate in simulated meetings of the Consultative Committee on Emergency Plant Pests and the National Management Group, and to develop a Response Plan. 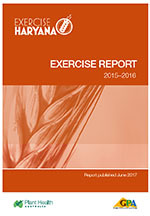 More information about the exercise and its outcomes is in the Exercise Report. For more information about simulation exercises or to discuss other potential simulation exercises, please email Stephen Dibley or call 02 6215 7709.